Response card: Handmade pumpkin-colored lokta cardstock. Do It Yourself (DIY) Square Invitation of pumpkin-colored handmade lokta paper from Nepal. Medium Assembly. 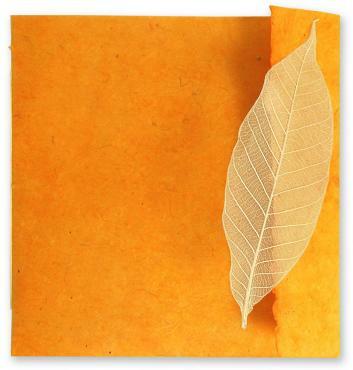 Elegant pumpkin-colored booklet of beautiful handmade lokta paper. Bound with waxed linen thread. Very natural yet sophisticated. Invitation is book style - with two facing pages (like a book). Cover has an inside pocket for enclosures. Closes with a real skeleton rubber plant leaf. Booklet is entirely tree free. 100% post consumer recycled paper envelope. Colors are natural tan and pumpkin. PAPER FACTS: Wrapper, Invitation sheet and rsvp card is made from handmade lokta paper (Daphne Bholua and d. papyrecea, a renewable bush that grows in the foothills of Nepal. Lokta paper is archival to at least 700 years). Envelopes are made from 100% postconsumer recycled paper, made in the US and/or Canada. Outer envelope: Husk opaque recycled paper with envelope liner made from mango leaves and pumpkin-colored mulberry paper (you glue in the liner). Invitation Sheet:Handmade natural lokta sheet - measures 5-3/4"x 11-1/2" (two facing pages for copy). Wrapper:Handmade lokta paper with one natural deckled edge. We score fold-marks into the wrapper for easy assembly. Binding Thread:Three-ply waxed linen thread. Professional bookbinding thread - waxed with bee's wax. Skeleton Leaf:Rubber Leaf - natural. Envelope Liner:Mango leaves and pumpkin colored mulberry tissue - cut to size. Tools:Bone folder, glue sticks, bookbinding awl (for poking holes).